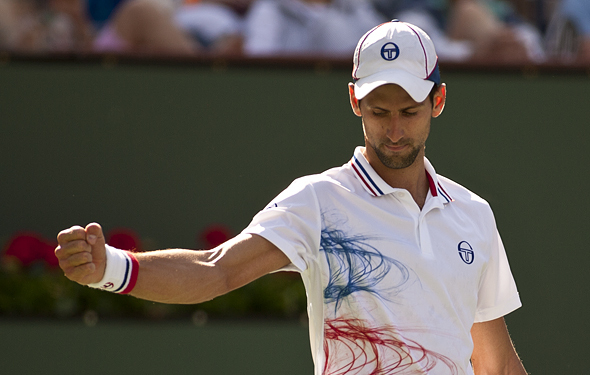 Novak is hoping to recreate his 2011 Rome heroics. It was at this time last year that the tennis world really got a sense that Djokovic was about to seize the top spot: he had beaten the Spaniard in the Indian Wells, Miami and Madrid finals, but Rome was on slower red clay and Nadal had rarely lost of that surface when healthy. But Djokovic hit through him once again and grabbed the Rome title in straight sets. While Nadal would win another Roland Garros a few week later, he didn’t have to beat Djokovic to do it. They would meet again in two other major 2011 finals at Wimbledon and the US Open, and Djokovic was again able to slightly over power him and outlast him. The mental stranglehold was on. But lo and behold, last month in Monte Carlo, Nadal stopped the Serb’s seven-match winning streak against him and won the title convincingly. Since then, he has won Barcelona, mentally bailed out on the slippery blue clay in Madrid (as Djokovic also did), and walloped his foes in Italy this week. He’s playing at an extremely high level, but so is Djokovic, who was very convincing in dispatching Roger Federer in straight sets on Saturday. The key for Nadal in the final is to play inside the court when he has chances, go for first serves, trust in his down the line game and not be predictable off his backhand side. Djokovic knows that he can stay with Nadal off the ground, punish his backhand side and is willing to keep moving inside the court until he has the Spaniard playing with his back against the wall. While I still feel that Djokovic is playing an overall better brand of ball this year, in my gut I feel that Nadal feels like he can get on top of him again and is willing to change up his patterns in order to do so. Nadal will win in three, which means hours AND sets.